I joined Redway Runners in March 2017 after graduating from Steve’s Saturday morning beginners group. Back in December 2016, I’d just moved to Milton Keynes and decided that my New Years resolution would be to meet new friends get healthier and fitter….and today, the shocking realisation is that 2017, has been the only year I actually stuck to a resolution!! I’d made my own attempt at the ‘Couch to 5k’ program and I have to be honest, hated every step of the way – up to and including a crawl around Park Run. However, a friend of a friend mentioned Redway Runners and I thought I’d have a look. Being inspired by other views of the club and the shared success stories – that sensible part of me watched as the crazy part sign up a beginners course. Whaaaattt…. a course in running, are you serious….??? From the graduation Park Run in March, I then completed the Rocket 5k and got my first running medal. It’s now hung proudly on my home office wall along with other ‘bling’ I’ve picked up over the past year. 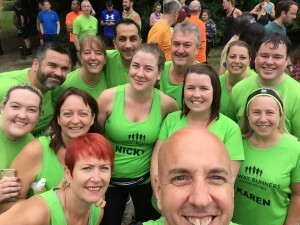 Part way through the beginners group, a very dear friend lost her battle with Cancer, so I decided that if she can go through what she did (6yrs of chemo, surgery and radiotherapy), then there’s absolutely no reason why I cant go through the pain of training for a 10k to raise funds for Cancer Research. Not only did I train properly for the distance, for the first time, I blogged about the whole experience. 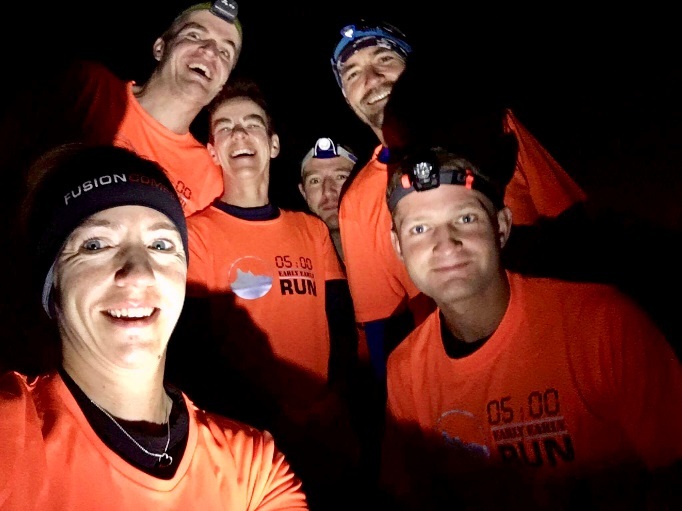 In reflection, I think that sharing with family and friends what I was doing – the good, the bad and the ugly parts of training, was tougher than the run itself. Hugely motivational and inspiring but very exposing! 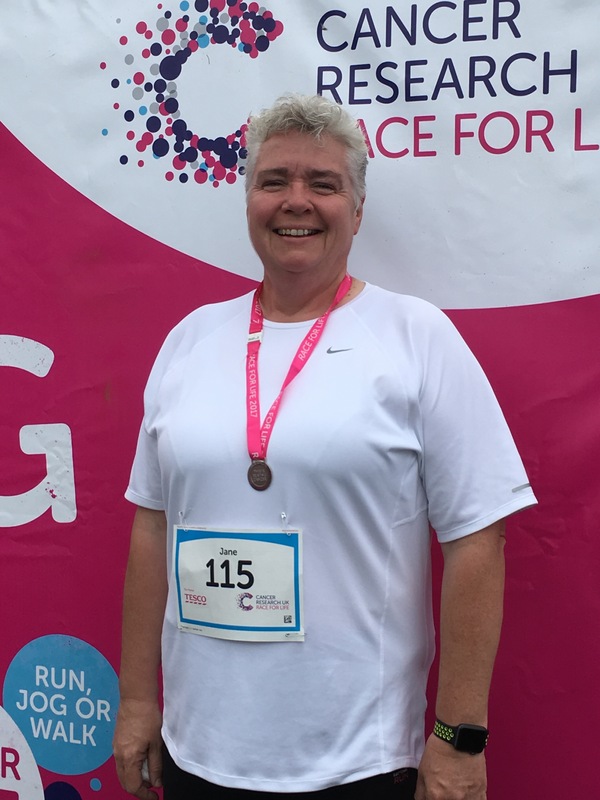 The end result of this was that by harnessing the power of social media, I managed to raise in excess of £4,000 for Cancer Research and I was now firmly hooked by the running bug. 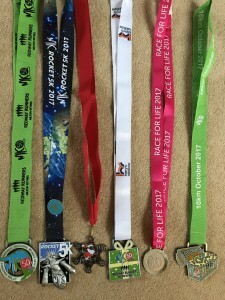 For the reminder of the year, I completed the Treasure Hunt 10k , The Furzton Relay, the virtual MK50 and of course, the Santa Dash. My motivation dropped a little in October when I managed to pick up a knee injury (twisted it getting out of the car in a hurry!). 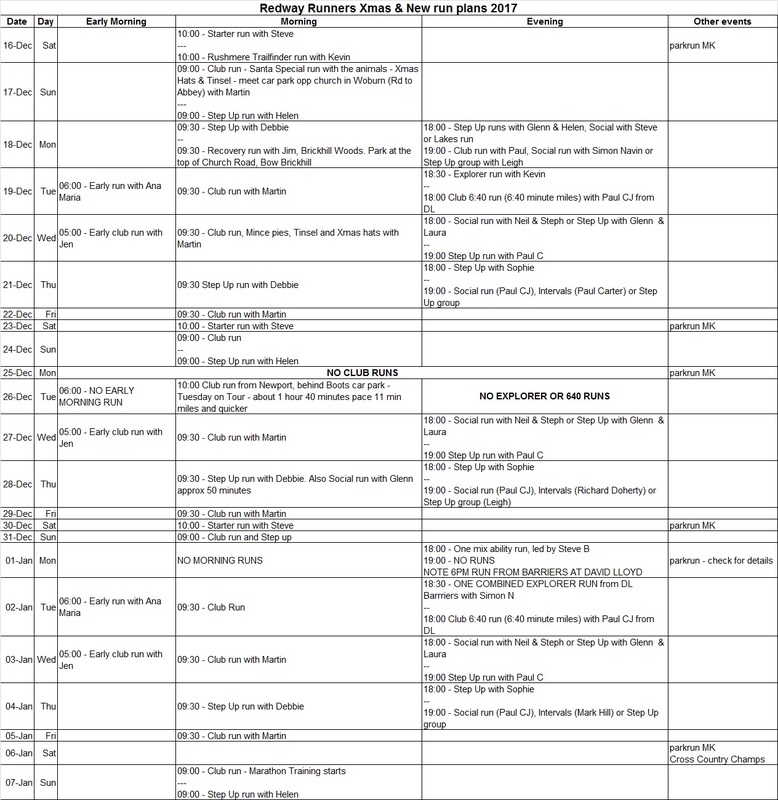 But now with the help of Rudi Chaplin at the Treatment Lab and training plan from Clean Coach Katie – I’m inspired to plan my running for the next year. 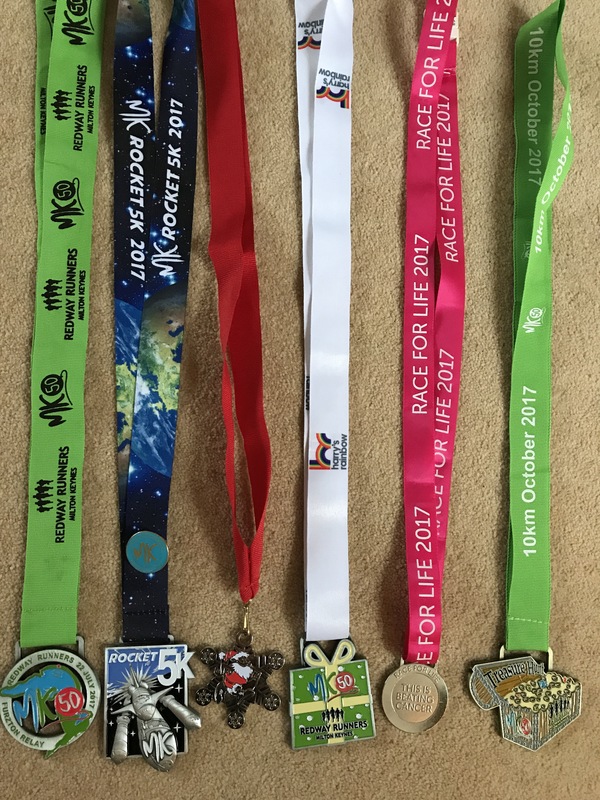 As I look back over the past 12months now 3 stone lighter and at the small collection of running medals, I get a real sense of achievement. None of this would have been possible without the great community and support from RRs and the great friends I’ve made along the way. Looking forward to seeing what 2018 has to offer. Another winter had passed with no running and I had signed up for the Festival of Running Half Marathon, my first race at this distance. I wasn’t a member of the running club at this point nor had much exposure to it as I was only running 50miles or so a year. It’s a race I won’t ever forget, my last one before joining the club and one with many mistakes. I remember the flooded underpass at mile 1, wearing too many layers, the heavy wind, poor pacing, seeing Nev cheering at the Redway station and being so surprised at the amount of cheers going to all of their runners despite the horrible weather and then the 2hr pace setter overtook me near the finish. I finished a broken man in 2hr 2mins and enough was enough – I was running with Redway Runners the very next week. With the motivation of the wedding coming up everything changed and I was hooked. 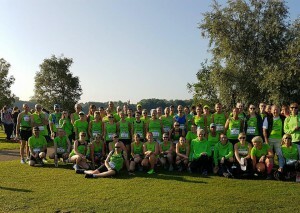 With two months of running with the club I met lots of new faces and soon got into a routine of running. 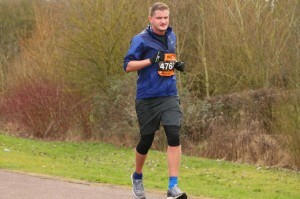 I signed up for the MK Half which was on the 1st of May with a goal of just setting a new best time. It was such a great experience and well supported half. I quickly found myself running in a group with the 1h 45min pacesetter and it felt tough as we approached the centre of Milton Keynes. I found my rhythm and even managed to pull away from the pacesetter as we approached the halfway point. The great support continued and with it being my first race in the club colours I soon began to understand what a family it is and what a difference having your name on the top really makes. ‘Come on Munns, ‘Come on Redway’ it was awesome and really push me through the middle phase with some quick splits. As I approached mile 10 I began to struggle with the pace slipping back to 8minute miles but still ahead on the 1m 45 pacer and now on the homestretch. I remember running into the stadium for the finish like it was only yesterday, such a fun way to finish the half. James Fuller one of the club runners was there with his family and cheered me on to finish strong, I found some more speed and overtook a few runners near the line and finish in just under 1h 43mins, the best feeling ever. One of the toughest moments of the year was near the finish at the Bedford Half, which was the first weekend after the honeymoon. I’d stopped for the third time at 12.5 miles, the PB was no longer in sight and I was broken. Like a ray of light out of nowhere Julie from the club appeared and gave me a simple ‘come on Ben, jog it home’ She was taking it easy as part of her Marathon training for New York and the Chester Metric but it was such a massive help to get me over the line – Thanks again Julie! 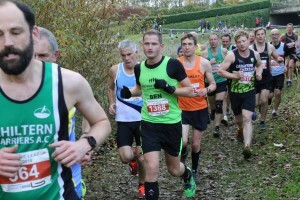 Joining the Chiltern cross country league on Neville’s recommendation was another great experience, it’s a great way to keep running over the winter and it’s just so different to any other form of running. The best thing about cross country is the support we get from the Redway women who always hang around to give us encouragement. Anyone who knows me will be aware that I adore cats and the Milton Keynes branch is all run by volunteers in their spare time and own homes. All your kind donations will go towards helping cats who are desperately in need of your support. Please, please, please be so kind and sponsor me if you can! Every donation, no matter how big or small, will go a long way in helping me to achieve my fundraising target. As an extra bit of fun anyone who donates £30 can choose ANY song for me to listen to on my run. I will pop round to see you so can add this my marathon playlist (Please be kind) and I won’t look at it before the big day! On the 6th on November it became Facebook official, I had been selected as a sponsored athlete for 2018 with The Treatment Lab and Clean Coach Katie. It felt great to get this good news and it gave me such a boost knowing that Rudi and Katie will be invested there time in me and my marathon journey. The prize consisted of monthly treatments with Rudi with more nearer the marathon, PT sessions with Katie and access to the weekly classes. Having this support is great especially with me having the added pressure of fundraising for the marathon. 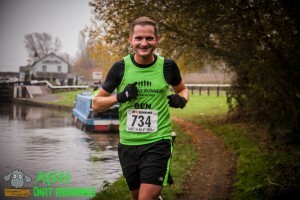 As part of the sponsored athlete programme it advised we should make a blog to diarise our progress but since starting this I have actually really enjoyed recapping my year so if anyone wants to hear more of my rambling visit my blog at the http://thegreenrunner.co.uk/ it’s still very much a work in progress but it’d be great to get anyone’s thoughts. It’s hard to really quantify what a difference the club has made me but in simple terms it meant I could lose weight, marry the women of my dreams and feel great on my wedding day, all down to the club and for £5 a year, wow what a bargain. As well as that I have met some fantastic people, I remember looking at Strava and it told me I’ve spent 41hours running with Maff, 27 with Jen and didn’t even know them until May. I have made some great friends in such a short space of time especially with the small but awesome Wednesday 5am group. Everyone from the club has been so supportive and invested in me, even Martin seems to know when I’m running a cross country event despite the club having over 1400 members and even made comment at the latest club run that I’ve had a good year which was fantastic to hear. For years I have been aware of the Redway Runners. Firstly my brother Neil Goodwin joined and then my husband Paul and then my sister in law Charlotte. I never got it and thought I could never run. I mean this most sincerely. I hadn’t run since PE at school and I didn’t enjoy it then! Paul mentioned about starting running and I made an attempt early this year to do the couch to 5k. It was nothing short of disastrous and I ended up injured and gave up, reaffirming running was not for me. Mother’s Day this year, we parked at the Pagoda car park and walked up the zig-zags. I was out of breath by the top. Paul said ‘I run up this on parkrun’ and I thought ‘how?!’. 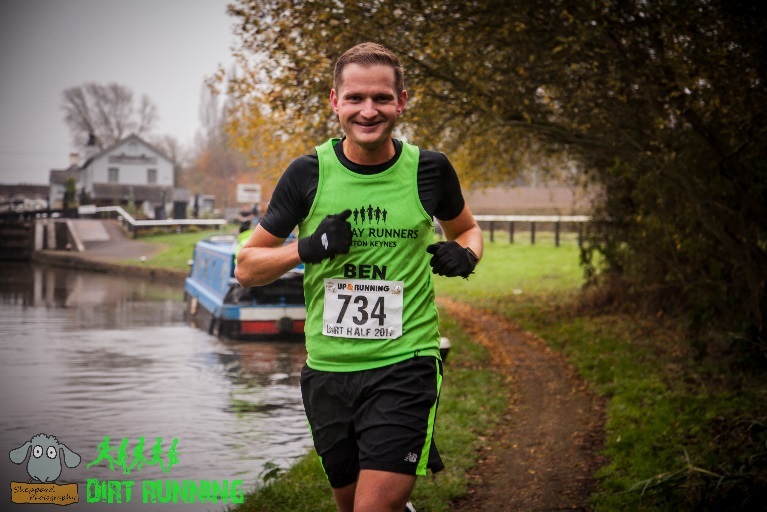 In April I decided to give running a try and joined Martin P’s beginners group. It was his first time as a group lead so I think we were both a little apprehensive! I wanted to get fit and to do something for me. I was far from keen but knew I would give it my best shot. My one aim was to be able to run 5k without stopping and to be able to do Junior park run with my 4 year old son without struggling. And so my journey began. I still didn’t enjoy it but what made it was the support from the buddy’s but the lovely people I met on my course. We were all in the same boat and there was no feeling or panic about failure. It was pure encouragement. I began to very slowly believe in myself and my confidence grew not only in my ability to run but my self confidence. I was always glad when a run had finished but the buzz I got when I looked at my Garmin was (and is) amazing. I did it! I’m doing it! Martin P was a real inspiration and support (and continues to be). So moving on, I began to improve slowly and started on occasions to enjoy running. 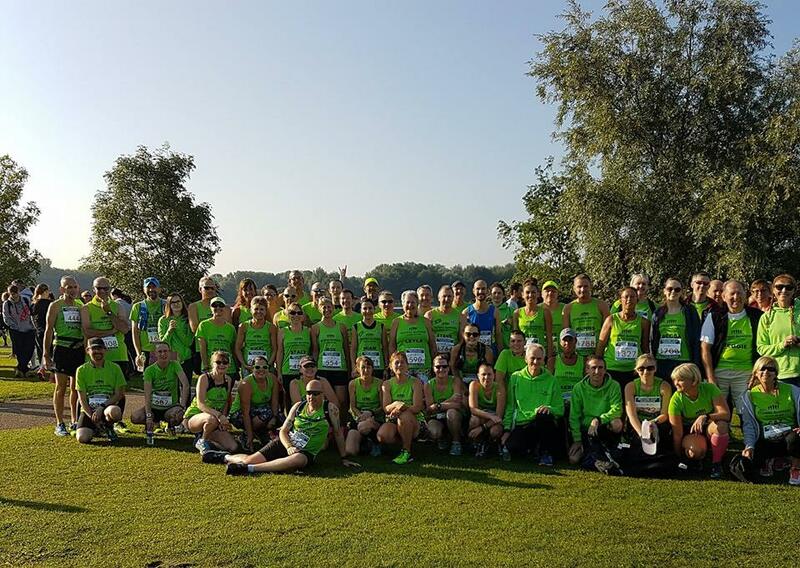 I signed up to my first 5k race – Emily’s star and loved seeing the green army turnout. Such a sense of belonging (although mental note to self, NEVER have 3 coffees prior to a run. Needless to say I had quite a good time!) I did some virtual races and started step up with the lovely Sophie which I still enjoy. First 10k was NSPCC and then on to Rockingham 10 miles. It’s not everyone’s cup of tea, firstly it’s cold and secondly it’s 3 and a half laps round the track but I decided not to check my Garmin and just enjoy which I did. After this, I had runners lethargy. I didn’t run for a couple of months for one reason or another and I got to the stage I felt I had left it too long to get back to. There was only one way to find out. I ran last Monday and managed 4 miles without stopping. I felt great. Since then I have run almost every other day and managed the first parkrun in ages. And so I’m happy to say my journey has resumed. I am looking forward to upping my personal game in 2018 and am looking forward to starting the course along with my best friend Tracey in January with Katie Tucker to increase my speed. In addition I have signed up to her 30 day challenge which I will embrace. 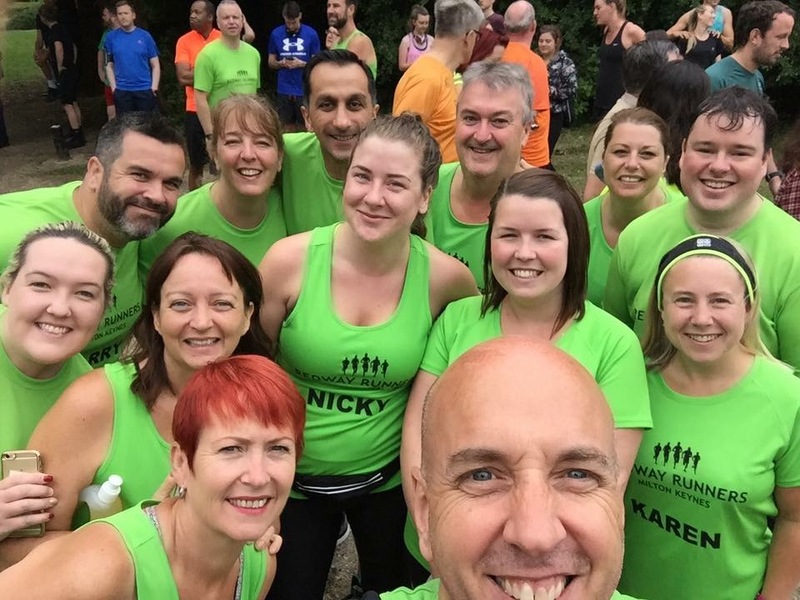 I have so much to thank the Redway Runners for and I’m proud to be running in my green t-shirt. Thank you to Martin L for managing the club so well and to the leaders and buddy’s who give up their time to help people like me. Looking forward to seeing everyone in the new year. This has been my first full year as a Redway Runner and what a year it has been! I started the year mentoring Gill Firmin, as she prepared for her first half-marathon. At the same time I started to train for the Liverpool marathon. The new year also gave me the opportunity to get involved with beginners for the first time, being a regular helper when Ros Crawley’s group. 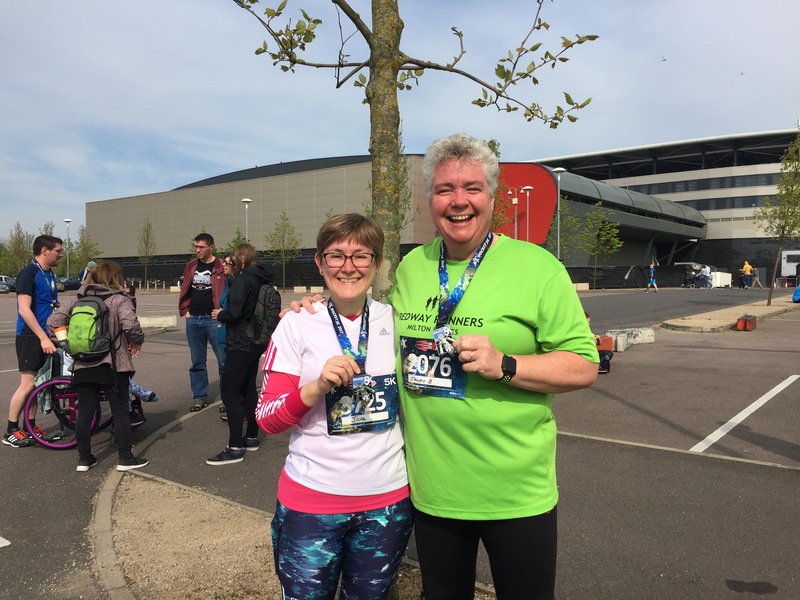 After running Gill’s first half with her at the mk festival of running, I then took on the mighty Oakley 20, which was a huge milestone for me. I had not run that far since the MK marathon in 2012. Whilst marathon training, I continued to notch up parkruns in a variety of places and achieved a huge PB in Bedford in March. I achieved my 50 at the end of April. This was around the time I took on my own beginners group and was delighted to have such a great bunch, some of whom have become good friends. 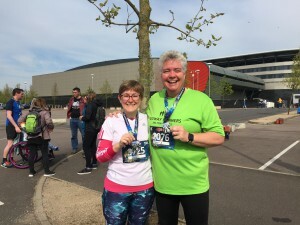 I also ran the MK half in May, buddying Elaine Wells. 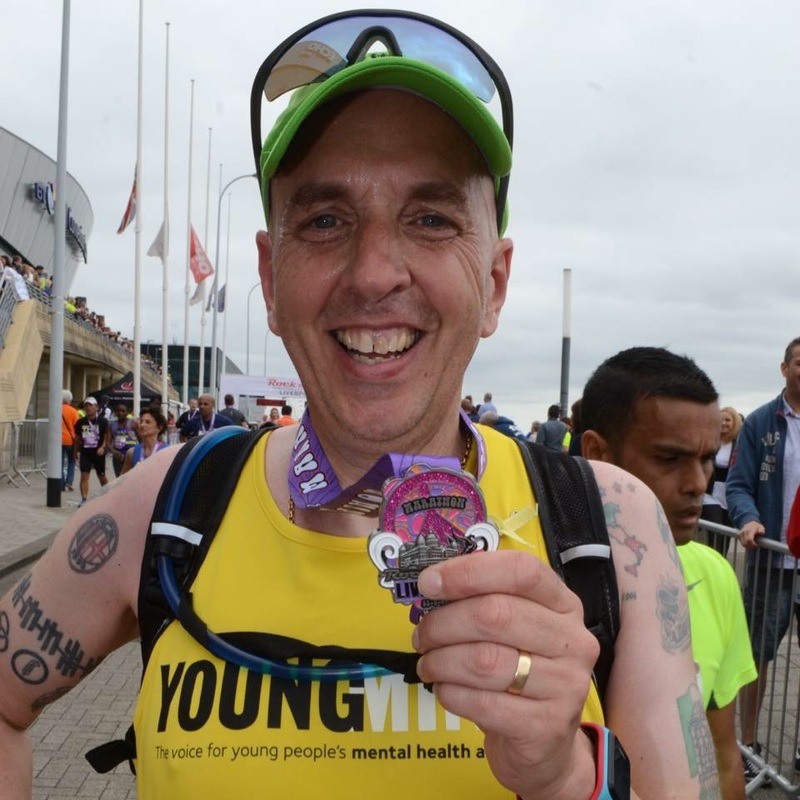 The high point of my year came on 28 May, when I ran the Liverpool Marathon in 4:29:37, which was 70 minutes quicker than my one and only marathon 5 years earlier. It was my first club trip and the whole weekend was incredible. So as not to stop running, I did the half at the RR festival of running in June. Soon after, my beginners graduated, which for me was a huge and emotional experience. Further half-marathons followed in Bedford and Bournemouth, as well as the treasure hunt half and the NSPCC half. I also ran the Great South Run and Rockingham 10, which were my first 10 mile events. I took a break from leading beginners, but kept my hand in by leading the homework run. 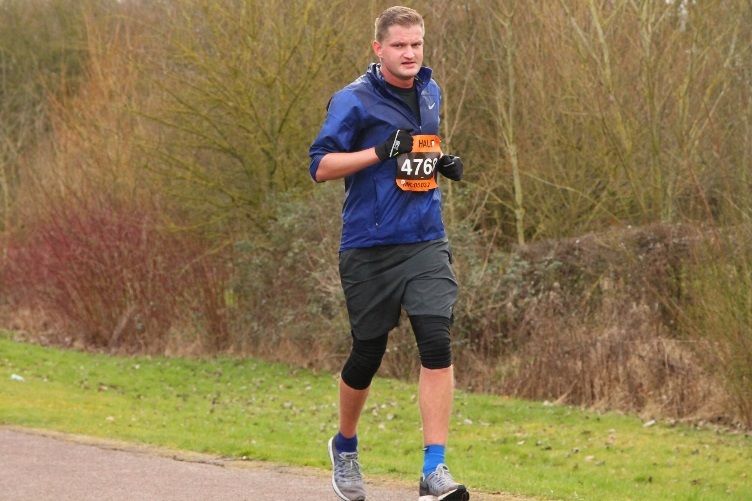 Illness forced me to withdraw from the Dirt Half and the Winter Half was postponed, but I have kept the mileage up, as I start preparing for the Milton Keynes Marathon in May. I finished the year by starting a group within the club to help people to address mental health difficulties. I have some very good friends in the club who have helped me with so many things. I would be foolish to try and list people, but I must single out Martin Lawrence, who has given me the support and confidence to achieve what I have achieved. Here’s to a 2018 full of running and happiness. Redway Runners are preparing to share the running love in the New Year with the launch of a further eight beginners courses. To join a free course, future runners are to book their place on the Redway Runners website www.redwayrunners.com or email Annette at beginners@redwayrunners.com. I don’t think you could improve on the help, advice, enthusiasm and also dedication the course leaders and their helpers give to encourage us over the 9 week course. On week 1, none of us think we will ever be able to run 5k in a couple of months’ time, but it is a tried and tested programme which works. Many thanks to everyone! Not really, such a good experience, lots of support and encouragement. I thoroughly enjoyed it and am so grateful to have had the opportunity to join in. am joking! I’ve pass on recommendation to all my Facebook friends to get on the next course. None! Fabulous club, I’m very happy to be a part of it. The course was great – thanks to Carol who was fantastic. I missed the first two weeks as I was on a waiting list but have attended every session after. The variety of the runs has been fantastic. Steph was wonderfully encouraging, thoroughly enjoyed the course. Anne’s homework group was also fabulous, lovely to have a continuation from the Monday session. Thank you. No. Steve was absolutely exceptional and the course completely exceeded my expectations. I can’t think of anything that would make it better! I can’t thank everyone enough for a fantastic introduction to running. Everyone is so friendly and supportive – I couldn’t have done it without you so a big thank you from me! The beginners course was extremely well organised and a fantastic experience. Everybody was so friendly and supportive and it was so inclusive. The fact it is free of charge is extraordinary in this day and age. I loved every single minute of it and can’t thank Carol and all the helpers enough. I have recommended the course to several others. Redway Runners and Sophie in particular, for giving up her own time so generously to support us beginner runners. I’m slow and unfit, but I feel like a runner – this is down to the encouragement and positivity of the club. Thank you! Excellent experience in every aspect. So grateful to Natalie (and all the helpers) for all their support and encouragement. I now have a new hobby! I’ve loved it and can’t think how anything can be improved. Well done! it’s been an amazing experience and I’m excited to be getting fit again, thanks to you guys!!! No suggestions but just wanted to say thank you for all the support and encouragement throughout the course and today at graduation. On Monday 18 December 7pm – 10pm come and join us at the MK Biergarten for a pre-Christmas tipple or two. Tickets are strictly limited to 50 so you have to act fast! And you will need to pay the princely sum of £1 on entry. Each year we have alongside the club Christmas party held a donation scheme, and again this year the club will be collecting for the Milton Keynes Food Bank for those not as fortunate as most of us. This year they are requesting Christmas selection boxes/chocolate boxes, tins of fruit, tins of meat, tins of rice pudding. Also toiletries that some people in the community find it hard to keep themselves clean not using the basic toiletries. So please bring items along to the club Christmas party on Friday 1 December or pass to any of the run leads who will make sure it gets to Rena and Martin so we can take it along after the event to the food Bank. Please just make sure that items are in date. We drew the club London Marathon ballot, representing Redway Runners at the 2018 London Marathon are Martin Lawrence, Fiona Siequien and David Gaskell. Well done to all the winners in the raffle, we made £2143.80 for the club charity of the year – massive thanks to Michelle GB for all the hard work in organising for the club.